Perhaps a harsh way of saying that what with time, an outrageously wet early summer, world champion eating slugs and snails means that my tender seedlings were wolfed. Did the raiders appreciate my Brussel Sprouts, Kale and Purple Sprouting Broccoli, carefully sown in modules, nurtured to sturdy little seedlings, carefully planted out and netted? Judging from the leafless and lifeless stems left I’d say they did. These slugs and snails have gourmet taste buds. Greens are a winter staple around here, that and the leeks, a few salads and some Oriental veggies. Replacements were needed, time was running out – trying to find new work, juggling life and well the ease of internet shopping and we have an answer – plants by post. 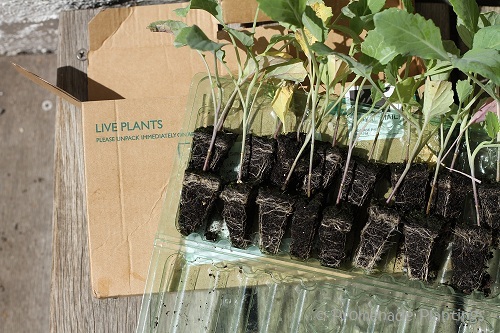 A clearly marked cardboard box LIVE PLANTS was delivered – I had visions of opening the box and the plants leaping out at me, yelling and kicking and screaming. But no there they were sedately tucked in plastic cartons for their journey to a new life, their shoots poking out of the tops. A few drops of water to liven them up and planted the following day. It’s a first for me, but a very practical solution. An option that is available. They are late going into the ground, they need to bulk up before winter, only time will tell if plants by post are a winner. Let’s just hope the slugs and snails have had their gastronomic fill and have moved on to pastures new! Best of luck with your beautiful new greens! It was like they held the Greedy Bug Ball on my plot ! Well they can move their party on somewhere else! Thank you Christine, we had two very dry years on the trot, and mild(ish) winters so the slime trail population seems to have expanded! Best wishes for your new growing season! I’ve had good luck with plants I’ve ordered in the past – wishing you the same…and huge flocks of hungry, bug-eating birds! I’ve never tried mail order, so It will be interesting to see – more expensive than seeds that’s for sure !! I’ve done them in the garden to mixed results, maybe I should give it another go on the allotment, so thanks for the reminder and encouragement ! and phew to cheap beer, the plants cost plenty ! I am often grateful for friends’ differing taste in beer for just this reason. We host a gathering and inevitably end up with un-drinkable (to us) beer in the fridge. Hmmm, another great reason for a party !! And yes, I love using wolf like that, and if my head was fully in gear right now I’d think of some others…..
See? This is why these pests are named snails and slugs. If they were better behaved, they’d have gotten much better names. You’d think, by now, they’d have learned. Sorry your garden met up with a stereotypical bunch, Claire. I hope your solution works. Have you tried little signs directing them to better greens “just over there”? So true, so true. I mean look at cute little kitty, or fluffy bunny, perfect examples of animal life being named properly 🙂 Mind you Marie probably doesn’t think bunnies are too cute when they munch through her veggies ! We use live plants sometimes, too…a full garden is better than no garden at all. It is not capitulation…. just management! Hope the critters don’t get you down….and that more sun is coming! Ha! Like you imagination about live plants. Triffids? Have you tried egg shells to discourage the snails? Hi Tandy and thanks for the suggestion, I have tried them but have had mixed results. Maybe I need to go back and look at all these remedies to see what will work fo rme. Water the surrounding ground with diluted coffee…. apparently is works and possibly worth a go? Best of luck! I don’t see any problem with internet plants – exactly the same as going to the greenhouse to buy started plants – without the drive time! Thank you 🙂 That’s a good point about no driving, more time in the garden then ! Darn those creeping pests. Good luck on this new attempt to get plants to harvest. If you don’t succeed at first, try, try again !! Thank you dear Nia, thank you ! They did look good Bridget which was a relief, nice and sturdy – I’m not used to buying plants (I grow from seed) so it’s a novelty for me – we’ll see how well they do……. I hope the slugs have had their fill and will leave your new plants alone. So do I Karen, I love my winter greens!! My kale is not yet ready to harvest, but by the time the critters finish with it, there may not be anything left for me. Aaawww, Keep trying! It seems to me some years are tricker than others, the cool and wet we had was perfect for slugs, but imperfect for my carrots, which are a no show !! The slugs are bad here in the the States this year too! I continue to be amazed at what can be mailed though. I can order chickens to be delivered if I want! How cool would that be, some chickens in the post !! I’ve had good luck sprinkling a combo of coffee grounds and epsom salts. Try that! I’ve never heard of that combination, thank you! !